With silvery green foliage and white flowers, Convolvulus cneorum lives up to its common name of Silver Bush. This is an easy care ground cover plant, evergreen, drought tolerant and it forms a small shrub or ground cover plant. The flowers have a buttery yellow eye and the foliage remains attractive year round. This is a great plat for the dry garden border, use it as a filler, or plant it as a low border. You can also grow the Silver Bush in a container where it adds low maintenance colour. Once established this is remarkably low care plant. Best in full sun it will grow well in containers and hanging baskets as well. Although it will tolerate dry soils, it performs at its best in a humus rich soil. Dig a little compost through the soil. plant and water in with a liquid seaweed fertiliser. A little additional water through the first summer will assist with establishment. You can prune the silver bush back in early spring as new growth commences. We suggest a hard pruning every 3 years and a little light pruning every year just after flowering. Common Names – Silver Bush. Spread – Will spread to around .8 metre. 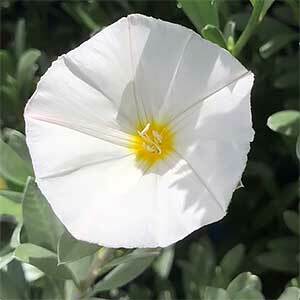 Convolvulus cneorum is available for sale from the following participating nurseries.